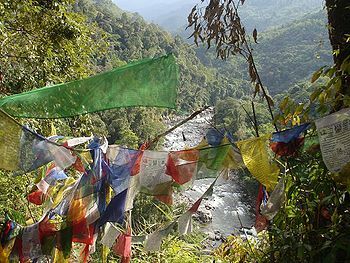 Thekchok Osel Chöling is a nyingma retreat place in Lower Pemakö, now in the northern part of India , founded by Togden Kunzang Longrol. It follows the Dudjom Tersar lineage and is a main retreat place of Deden Tashi Chöling. The landscape from Thekchok Osel Chöling is very spaciousness and offers a complete panoramic view. The front view is of ‘’’Dewakota’’’, a supremely holy place only a few miles of distance, , and which embodies the blessings of all the holy sites of lower Pemakod and the location where Dudjom Rinpoche bestowed the Rinchen Terdzö empowerments for the first time in his life. ’In the front the unceasing river of blessing flows from the three holy sites. And with the smile of mountains and valleys around ever gracing the land, It is a significant place where samadhis spontaneously arise and ever flourish”. Garwang Sangye Dorje Phulung Sangye Rinpoche, who was the teacher of many masters, including Dudjom Rinpoche himself. Tertön Chhoje Lingpa, one of the most important treasure revealers in the Nyingma tradition, who also lived on the retreat land for many years. Phulung Sangye Rinpoche, Terton Chhoje Lingpa and Togden Kunzang Longrol were very closed and would often do meditation practice retreats together in Thekchok Osel Chöling. On this retreat land, there is a small creek with a water source which is said to have been revealed by these three masters together as as the water source for the retreat land. Tulku Orgyen Phuntsok, who has been recognized as the incarnation of Togden Kunzang Longrol , now oversees Thekchok Osel Chöling. On the upper part of the land, there is now a small temple with a complete set of facilities for sadhana practice. Surrounding this, there are cabins which have been used by three-year retreatants and also by many short-term retreatants. ↑ Upper Pemakö is now part of the Arunachal Pradesh state of India. ↑ Tertön Chhoje Lingpa was one of the incarnations of the three revealers of the land of Pemakö, known as "Beyul Rigzin Namsum," or "Three Vidyadharas of the Hidden Land". This page was last edited on 24 December 2018, at 12:33.